Welcome to the archives! *bows* Here we house creative works written by the Asylum's talented residents. If you'd like to join us and have your work archived, please head over to submissions for the rules. If you'd like to archive any of the author's fics, please contact them for permission. NIHONGO TANGO I use a little Japanese in my fics so I decided to include a mini-dictionary of the words and names I use. Over 150 words so far! Short explanations of a few common fanfic terms. FANFIC BIOS Okay, I admit here and now that I got this idea from Iyo Ichii. Here you'll find a brief bio on each of my fic characters. KOGEKI/ATTACKS Short list and description of the special attacks that I've created for my characters. FAMILY TREES Wanna know who's married to who or which kids belong to what characters? Head here to make sense of the families in my universes. WHAT'S IN A NAME? In the tradition of the master, Akira Toriyama, many of my character names are running jokes, play on words or homages to someone or something else. This explains `em all! Wanna know when I update this stuff? Then sign up for the Asylum Editorials! It's a great way to keep track of what's going on and put your two cents in! Disclaimer: Here we go. 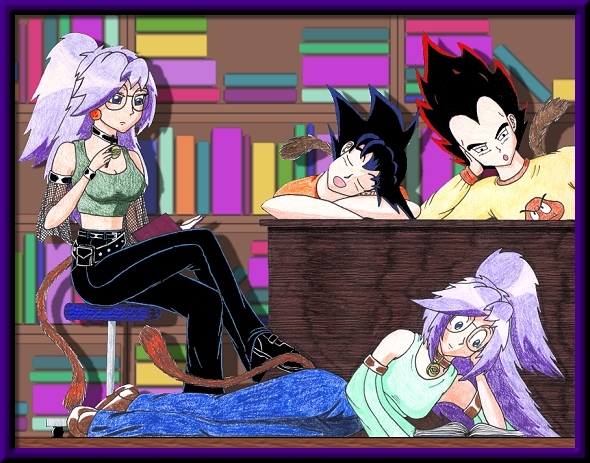 I do not own any of the characters from Dragonball, Dragonball Z, or Dragonball GT. They are all the property of Akira Toriyama, Bird Studio, Toei Animation, and Funimation Inc. However, all the other characters in my stories are mine. I'm not making any money off of this, its just for fun. And to top it off I'm a college student who works part-time at Wal-Mart so you know I don't have any money. So if you sue me you won't get anything.